When stimuli are consistently paired with reward, attention toward these stimuli becomes biased (e.g., Abrahamse, Braem, Notebaert & Verguts, et al., Psychological Bulletin 142:693–728, 2016, https://doi.org/10.1037/bul0000047). An important premise is that participants need to repeatedly experience stimulus–reward pairings to obtain these effects (e.g., Awh, Belopolsky & Theeuwes, Trends in Cognitive Sciences 16:437–443, 2012, https://doi.org/10.1016/j.tics.2012.06.010). This idea is based on associative learning theories (e.g., Pearce & Bouton, Annual Review of Psychology 52:111–139, 2001) that suggest that exposure to stimulus–reward pairings leads to the formation of stimulus–reward associations, and a transfer of salience of the reward to the neutral stimulus. However, novel learning theories (e.g., De Houwer, Learning and Motivation 53:7–23, 2009, https://doi.org/10.1016/j.lmot.2015.11.001) suggest such effects are not necessarily the result of associative learning, but can be caused by complex knowledge and expectancies as well. In the current experiment, we first instructed participants that a correct response to one centrally presented stimulus would be followed by a high reward, whereas a correct response to another centrally presented stimulus would be paired with a low reward. Before participants executed this task, they performed a visual probe task in which these stimuli were presented as distractors. 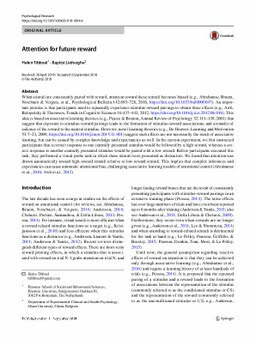 We found that attention was drawn automatically toward high-reward stimuli relative to low-reward stimuli. This implies that complex inferences and expectancies can cause automatic attentional bias, challenging associative learning models of attentional control (Abrahamse et al., 2016; Awh et al., 2012).